Happy Monday folks! As I’ve mentioned in multiple posts before this, my mom and sister both have fabulous closets. That said, whenever I get the opportunity to borrow a piece from either of them, I do it without hesitation. With a bag like this leopard-print, calf-hair Celine, can you really blame me? My sister picked up this bag during our trip to Paris last May and it has been haunting my dreams! Isn’t it a beauty? 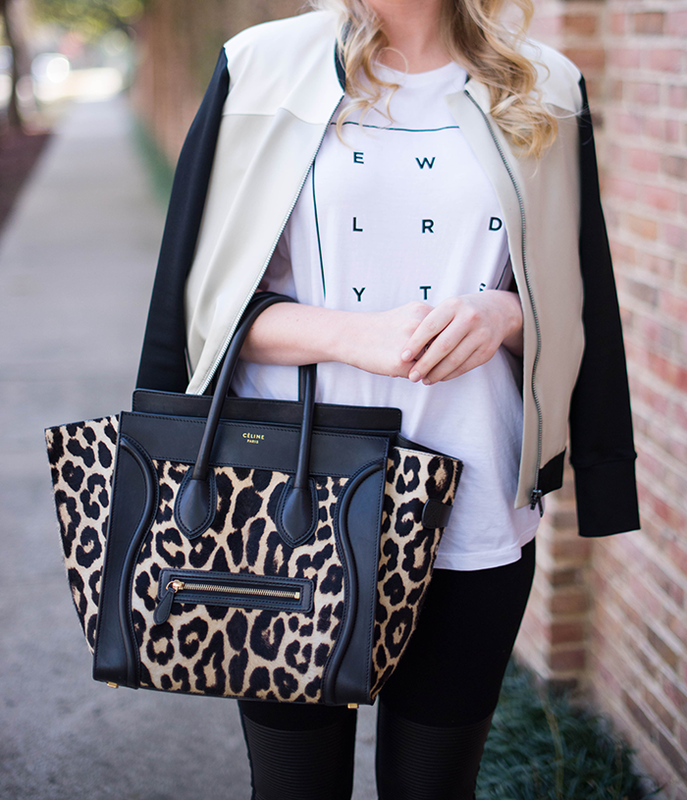 It’s a legitimate statement bag, but since we all know leopard is a neutral, it goes with everything! I styled it with my beloved bomber from SCOOP NYC (now on sale!) and my go-to J BRAND moto jeans (also on sale – can’t beat this pair!!). In addition to the bag, this tee may be new to you. It’s actually a collaboration between sweet Julie of Sincerely Jules and rewardStyle (my previous employer and the best blogger affiliate program out there!). 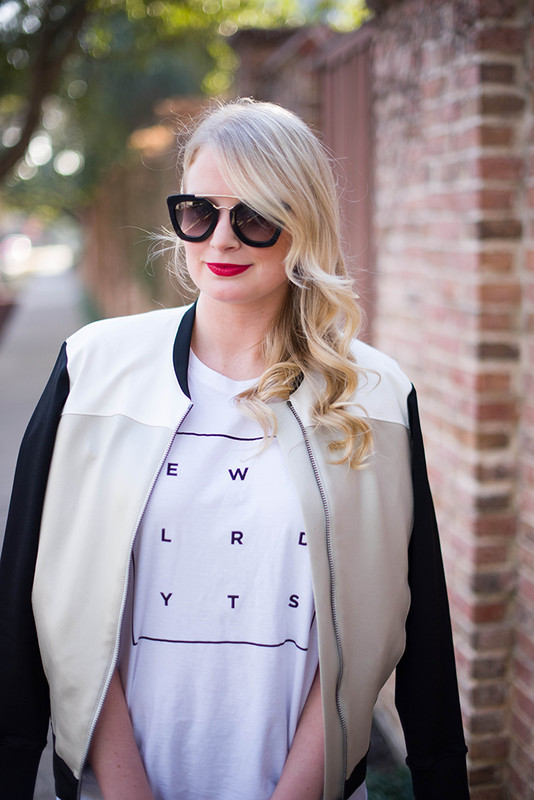 While this custom shirt was only given to a handful of bloggers (lucky me! ), Jules has an entire collection of cool tees and sweatshirts available here. You may have seen this one around on Pinterest – it’s definitely the most popular piece! PS – do you see those little hotspots over the first photo in this post? You are now able to shop each product straight from that photo! Just click on the box next to the item you want to shop and you’ll be taken straight to it. Enjoy! Honestly I was never on the Celine bag bandwagon but this one is a beauty. Your sis has excellent taste. Love your jeans and sunglasses as well. You are one stunning lady, am dying for that bag gorgeous, lucky sister:) and the jeans, Shoes fabulous, got me coming back to your amazing blog. Beautiful bag and love the tee! Love your whole looks as always. That bag is AMAZING!! 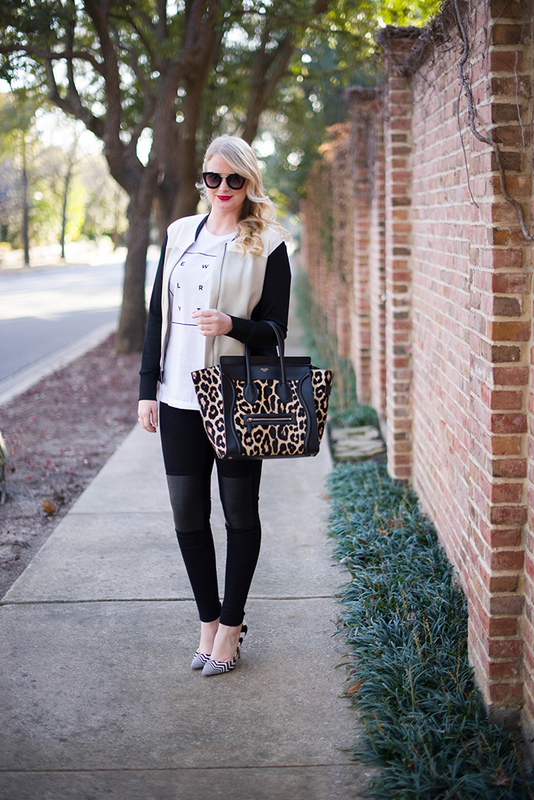 Love it paired with the black and white shoes too! That Celine is a statement piece indeed. I don’t blame you for taking any excuse to borrow it from your sis. It’s a beauty! It goes great with the whole look, especially the bomber! I love your bag its amazing !! That bag!! I’ve never seen one like that, it’s amazing! Can we talk about those jeans?! I love the detail on the knees. Cannot wait to hear more about you Sunday! I have no words for your handbag collection. That Celine is incredible! The bag is beyond amazing and I LOVE those jeans! That shirt is way too cute! And I am just dying to get those sunglasses! omg- If I were you, I’d never give that bag back! Ha! 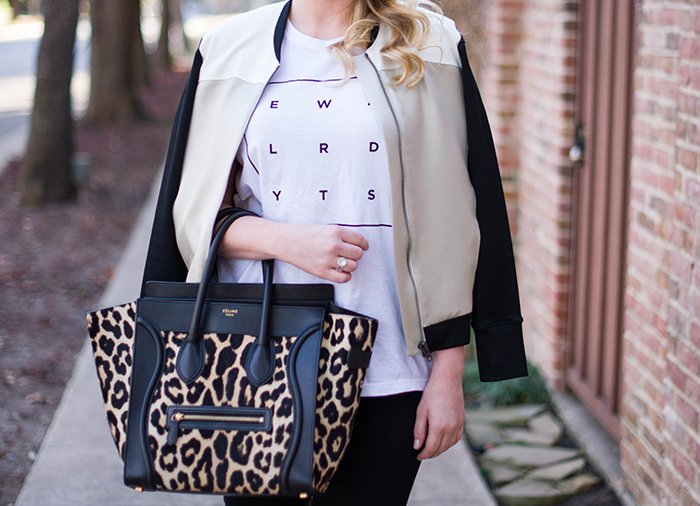 I love the whole Sincerely Jules collection – cutest tees! get outta here with that bag!!!!! LOVE, also would you mind telling me/posting about how your friend in your recent instagram did that piece of art, I am wanting to paint something for me room! Love the shirt! Such great quality! I’m totally going to have to check out her other items! You seriously own my fantasy closet! That bag is to die for. Loving the lip color pop! ohhhh LOVE the mixed prints! those shoes are to die for! Loving the Celine – jealous. This bag! This shirt!! BTW, where can I get this shirt? I didn’t see a link to it in the post? If you read the text below the photos, I mention that this shirt was a custom design and only given to a handful of people. Unfortunately it is not available for purchase! Sorry! I’m in love with your tee, and you’re so lucky to have a mum and sister with amazing wardrobes also! OMG! I’m obsessed with the Celiné, but I’m a handbag junkie. Love your ensemble! I would seriously have dreams about that bag as well it is absolutely gorgeous! love love love your heels and bag! super cute look! glad I found your blog! Love that tee! Thinking about pulling the trigger on the Celfie one.. I had no idea you’ve left rewardstyle! Congrats on the career change and (as always) I love reading The Style Scribe! Pingback: its very cute and roomy too! · Life the joy!